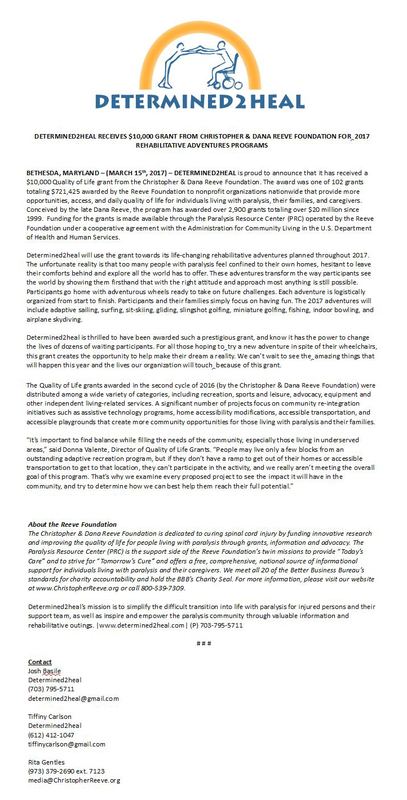 We are excited to announce that Determined2heal was chosen by The Christopher & Dana Reeve Foundation’s Quality of Life program to win $10,000 this year! With this grant, our goal is to take more people on rehab adventures than ever before. Read our official press release on winning the money below. This entry was posted in News & Updates and tagged Christopher & Dana Reeve Foundation, Reeve foundation quality of life grant, rehab adventures, Spinal cord injury on March 31, 2017 by Tiffiny. Beautiful. That’s the first word that comes to mind when you see Marrianne Rooprai, one of the most well-known SCI recovery advocates in the UK, but her beauty goes deeper than just a pretty face. With her strong spirit, she’s made it her mission to disprove some doctors’ limited expectations of what people with SCI are capable of doing. And she’s making her dreams come true. From co-founding the Rooprai Spinal Trust to raise money for SCI rehab to helping others with SCI by donating equipment worldwide, Marrianne is a fierce female who’s making a huge difference. As the winner of our first #WhatSCI contest, we’re thrilled to share her story. In 2004, Marrianne was 27 years old and had just started a hospitality company with her now-fiance, Andy. Her life was filled with travel and work she loved, but it all came to an abrupt halt when she sustained a C2-3 injury from a car accident and was told she would never move anything from her shoulders down again. She was left with the mobility of a C4 quad. Marrianne refused to take the prognosis at face value, looking at it instead as a challenge. She immediately undertook one of the most incredible regimens ever attempted by anyone with her level of injury. She combined exercises such as treadmill walking, weight training and biofeedback (which stimulates weak nerve connections) to get to her current mobility level (around C5). And Marrianne has been working at it for nearly 13 years to get as much return on her investment as possible. In fact, she has achieved many “firsts” in the exercise world as a quadriplegic. In 2012, she became the first female quadriplegic to use a FES rowing machine (using her Activehands gloves). The next year she became the first quadriplegic at her level to use the Ekso exskeleton (watch her walk in it here). For biofeedback, Marrianne travels to Miami yearly for sessions at the Brucker Biofeedback Clinic, which have helped her immensely. From her hands to her overall great shape and muscle tone, and her strong biceps, Marrianne has indeed proven her doctors wrong. Soon after her injury, Marrianne’s boyfriend, Andy, proposed a genius idea – to start a spinal cord injury trust. The goal would be to raise funds for spinal cord injury rehab scholarships, help pay for Marrianne’s rehab, and to send equipment to people in need worldwide. They named it the Rooprai Spinal Trust and it’s 100% volunteer-run to this day. And the trust has done a lot to help the lives of others with paralysis since its founding. One of its biggest donations is supplying Activehands to quadriplegics (who can request them on the site), which are life-changing gloves that allow many to lift weights again. The trust also includes the Physio Scholars program that helps people with SCI get the rehab they deserve and need. Learn how to apply here. And they’ve also donated tens of thousands of pounds to SCI research. Marrianne and Andy have taken a seemingly life-ending situation and turned it into a full-blown success. With their successful Rooprai Spinal Trust, annual fundraisers, constant networking and a life filled with travel, they have proven that with raw determination, and let’s face it, a lot of high-quality exercise, dreams can be realized. Have you tried activity-based rehab since your injury? 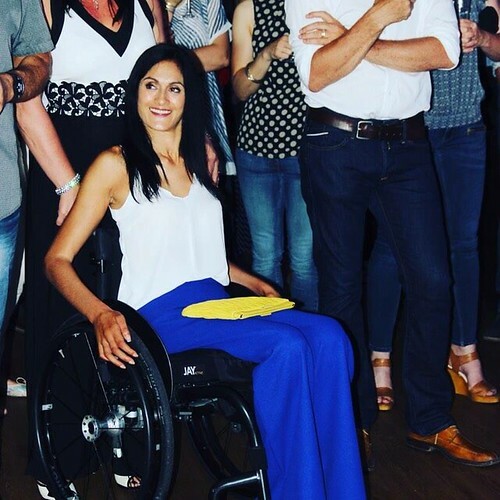 This entry was posted in Feature stories, News & Updates, SCI Superstars and tagged marrianne rooprai, prime physio, quadriplegic recovery, spinal cord injury trust uk, the rooprai spinal trust on March 31, 2017 by Tiffiny.